Real-time Oulu NM count rate, updated every five minutes. A neutron monitor is an instrument that measures the number of high-energy particles impacting Earth from space. 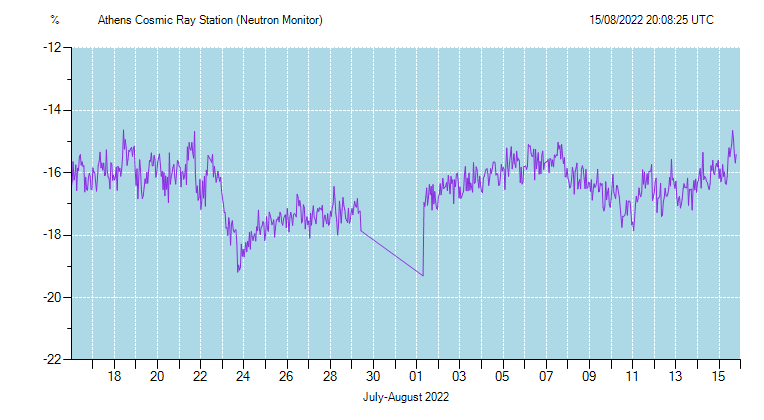 For historical reasons these particles, mostly protons and helium nuclei, are called “cosmic rays.” Because the intensity of cosmic rays hitting Earth is not uniform, it is important to place neutron monitors at multiple locations in order to form a complete picture of cosmic rays in space. Cosmic ray rates are affected by solar wind strength and density, and therefore CMEs can have a major effect when they “sweep away” some of the neutrons within the area of the earth’s magnetic field. The first image below shows the effect of a CME impacting earth on 2017-07-16 following an M1.4 (semi) earth-directed solar flare. This is called a “Forbush Decrease”. Cosmic ray bursts are caused by supernovae and other galactic events. The second image shows a Forbush decrease following an X9 flare and earth-directed CME on 2017-09-07. It also shows a minor “Ground Level Event” where protons have reached ground level following a large X8.3 flare (from the same sunspot group). These events can cause an increase in radiation dose particularly for high altitude flyers especially flying over polar routes. For further very detailed background information see here. Should not be used for scientific research purposes.